A drug bust on one of California's most popular trafficking routes this week turned up liquid drugs disguised in liquor bottles, a new trend police are trying to combat. On Monday, California Highway Patrol officers found 15 Mexican-brand tequila bottles that were actually filled with 56 pounds of liquid methamphetamine. The bust came during a drug stop on the heavily-trafficked Interstate 5 in Fresno County. According to the California Highway Patrol, Mexican drug cartels have began manufacturing drugs in liquid form to send north into the United States and Canada, shipping the drugs disguised in liquor bottles. The Highway Patrol found the drugs after pulling over a vehicle driven by Rene Diaz, 22, and Veronica Carrasco, 38, both of Oregon, on Monday afternoon. According to spokesman Matt Radke, the officer noticed the drivers "acting nervously," and used his drug sniffing K9 to search the vehicle. Radke noted that officers commonly travel with K9s on Interstate 5 because of its prominence as a drug trafficking route through the US from Mexico to Canada. "This is a new trend of transportation from Mexico to the States," Radke said. The amount of methamphetamine seized is estimated to be worth more than half a million dollars, he said. "At this level of amount, it is going to be distributed all over the place. Once it gets to the final form, the powdered form, it's going to be disseminated throughout the country," he told ABC News affiliate KFSN. Diaz and Carrasco originated from Southern California for their trip and told officers they were heading to Oregon. The bottles, he noted, had labels that were completely in Spanish. The pair was charged with federal drug trafficking and attempting to traffic across state lines and are being held in Fresno County jail. Did you expect it to? 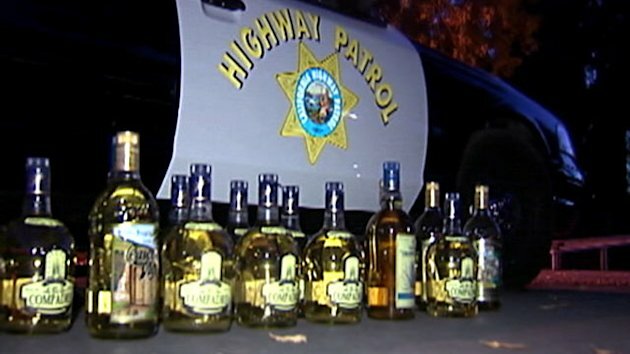 California Highway Patrol officers found 15 Mexican-brand tequila bottles that were actually filled with 56 pounds of liquid methamphetamine . . . The bottles, he noted, had labels that were completely in Spanish. Should've been a tip-off . . . I hope the solvent they use is safe..
What if somebody took a shot of it? Thinking they would be poisoned first... dog know what they used as a solvent. From using the googles... looks like acetate. Sounds like a self correcting problem either way. The war on drugs was lost the day it was penned.